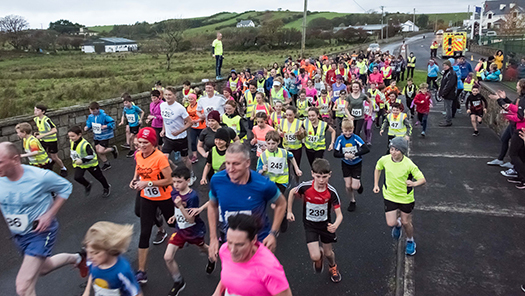 The annual 5k fun run for St Brendan’s NS took place on Thursday the 12th of October. Over 250 competitors took part on the evening and it proved to be a fantastic event. Both young and old enjoyed the evening and it was great to receive such brilliant support from all the community. Over the past 8 weeks, the children in the school have worked with volunteers after school on a Monday in preparation for the event. There has been such positive feedback from all involved and we hope to build on increasing the numbers for next year. The children have benefited greatly over the weeks of training. We wish to thank everyone for all the support for the event. We are a very luck school to have such loyal support from Kilmeena, Carrowholly, Fahy and indeed the wider community.